english name "Red-Skirted Slender Caesar"
1. Amanita rubromarginata, type, Ishigaki Isl., Okinawa, Japan. 2. Amanita rubromarginata, type, Ishigaki Isl., Okinawa, Japan. 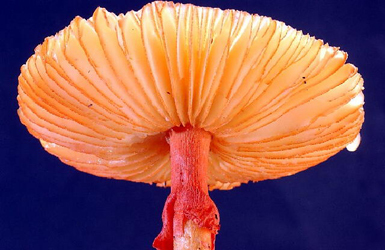 cap The orange to brownish orange then reddish yellow cap of Amanita rubromarginata measures up to 80 mm wide and has a long sulcate-striate margin. The cap is at first cylindric-campanulate then expands to nearly plane to slightly concave and subumbonate. It is glabrous and subviscid when wet. 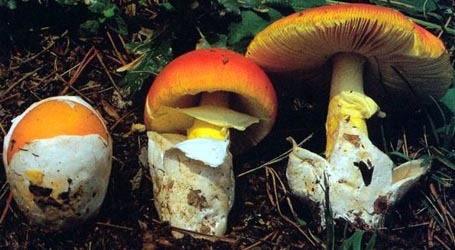 The flesh is soft, 3 - 7 mm thick in the center, yellowish white, and deeper yellow below the cap skin. gills The gills are free, very close (55 - 70 reach the stipe), pale yellow and have reddish orange edges. Short gills are of diverse lengths. stem The stem is 60 - 120 × 5 - 16 mm, yellow, and has a thin, membranous, reddish orange annulus and and a thick, white, saccate volva. 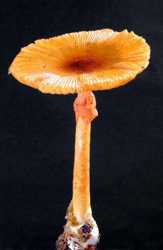 The stem is subcylindrical or slightly tapering upward, hollow, silky fibrillose, and appressed with indefinite, orange-red squamules forming irregular transverse zones. spores The spores measure 8 - 9 × 5.5 - 7 μm and are broadly ellipsoid to ellipsoid and inamyloid. [Note: RET spore measurements from an isotype specimen are 7.5 - 9.5 (-10.5) × (5.8-) 5.9 - 6.9 (-7.6) μm, with spores dominantly ellipsoid, sometimes broadly ellipsoid, and rarely elongate.] Clamps are present at bases of basidia. author Har. Takahashi. 2004. Mycoscience 45: 372, figs. 1-2. The following material is from the protolog and from original research of R. E. Tulloss. pileus from protolog: 40 - 80 mm wide, at first orange (6B7-8) to brownish orange (6-7C7-8) overall, then reddish-yellow (4B7-8) toward margin, in age grayish yellow (4C7) over disc, at first cylindric-campanulate, expanding to nearly planar to slightly concave and subumbonate. glabrous, subviscid when wet; context soft, yellowish white except deeper yellow just below pileipellis, 3-7 mm thick over stipe; margin long sulcate-striate; universal veil absent. lamellae from protolog: free, very close (55 - 70), pale yellow, up to 10 mm broad, with edges fimbriate and reddish orange (7B7-8); lamellulae in 1-3 "series." stipe from protolog: 60 - 120 × 5 - 16 μm, pale yellow, usually covered with reddish orange (7B7-8) appressed "indefinite squamules forming irregular transverse zones," subcylindric or slightly narrowing upward, silky fibrillose; context hollow; partial veil subapical, thin, membranous, 10-15 mm wide, reddish orange (7B7-8), striate [above]; universal veil as saccate volva, 20 - 40 × 10 - 25 mm, thick, bilobate, white, sometimes stained dingy brown. odor/taste from protolog: Odor and taste indistinct. pileipellis from protolog: filamentous hyphae 4 - 8 μm wide, with orange (5A6) to deep orange (5A8) intracellular pigment, thin-walled; clamps occasional. pileus context from protolog: filamentous hyphae 5 - 14 μm wide, colorless, thin-walled, "parallel to...pileipellis elements." lamella trama from protolog: bilateral, narrow; with intercalary cells cylindric to clavate to subfusiform. subhymenium from protolog: inflated ramose, 20 - 40 μm thick, comprising subglobose to ellipsoid cells in 1 - 3 layers. universal veil from protolog: On pileus: absent. On stipe base: filamentous hyphae 4 - 8 μm wide; inflated cells scattered, oblong or broadly clavate or ellipsoid or subglobose, 35 - 75 × 12 -40 μm. lamella edge tissue from protolog: inflated cells plentiful to scattered, narrowly clavate to pyriform, 30 - 60 &time; 8 - 15 μm, thin-walled, colorless or with dark orange (5A8) to orange (5A6) intracellular pigment. from protolog: [20/2/2] 8 - 9 × 5.5 - 7 μm, (Q = 1.28 - 1.45), colorless, smooth, thin-walled, inamyloid, broadly ellipsoid to ellipsoid; apiculus sublateral and truncate-conic (both per figure); contents as large refractive guttule; color in deposit not recorded. from isotype in RET: [21/1/1] 7.5 - 9.5 (-10.5) × (5.8-) 5.9 - 6.9 (-7.6) μm, (L = 8.5 μm; W = 6.3 μm; Q = (1.21-) 1.22 - 1.43 (-1.69); Q = 1.34), hyaline, colorless, smooth, thin-walled, broadly ellipsoid to ellipsoid (infrequently elongate), often adaxially flattened; apiculus ?? ; content dominantly monoguttulate with occasional small granules; color in deposit not recorded. 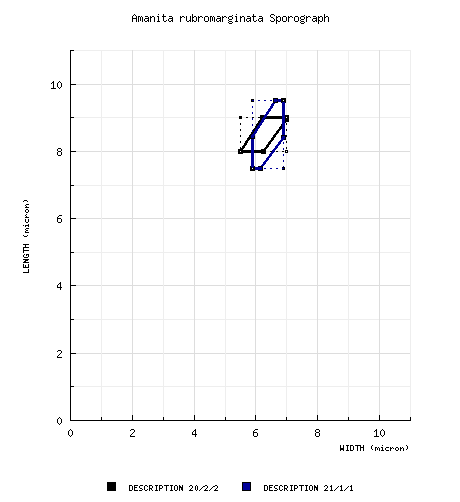 ecology from protolog: Scattered. In broad-leaved forest dominated by Quercus miyagii Koidz. and Castanopsis cuspidata (Thunb. ex Murray) Schottky var. sieboldii (Mak.) Nakai..
material examined from protolog: JAPAN: OKINAWA-KEN—Ishigaki Isl., Ishigaki-shi, Banna-dake, 8.vi.2001 H. Takahashi s.n. (paratype, KPM NC0010087), 15.ix.2003 H. Takahashi s.n. (holotype, KPM NC0011979; isotype, RET 383-1). RET: JAPAN: OKINAWA-KEN—Ishigaki Isl., Ishigaki-shi, Banna-dake, 15.ix.2003 H. Takahashi s.n. (holotype, KPM NC0011979; isotype, RET 383-1). discussion The author gives the Japanese name for this species as "fuchidori-tamagotake." photo Dr. H. Takahashi - (1-2) Ishigaki Island, Okinawa, Japan. select a collection to review/add spore measurements..#786512. H. Takahashi, #s.n., JAPAN, OKINAWA-KEN, Ishigaki Island, Ishigaki-shi,..#786513. H. Takahashi, #s.n., JAPAN, OKINAWA-KEN, Ishigaki Island, Ishigaki-shi,..#786514. H. Takahashi, #s.n., JAPAN, OKINAWA-KEN, Ishigaki Island, Ishigaki-shi,..